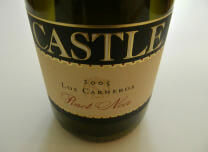 Castle Vineyards is located in the historic Buena Vista region of Carneros. The winery was founded in the 1990s by winemaker and vineyard manager Vic McWilliams who focuses on small lots of hand-crafted wines. Total production is 5,600 cases of red varieties. A tasting room with outdoor seating is located on the Sonoma town plaza at 122 W. Spain St.. Open daily from 10:00 to 5:00.